Have you ever received an unexpected gift? Isn’t it the best feeling? Unexpected gifts are my very favorite to receive and to give. I love that I can make someone’s day or maybe even a whole week just by doing something small for them. That is how the So-Da gift tag was born. 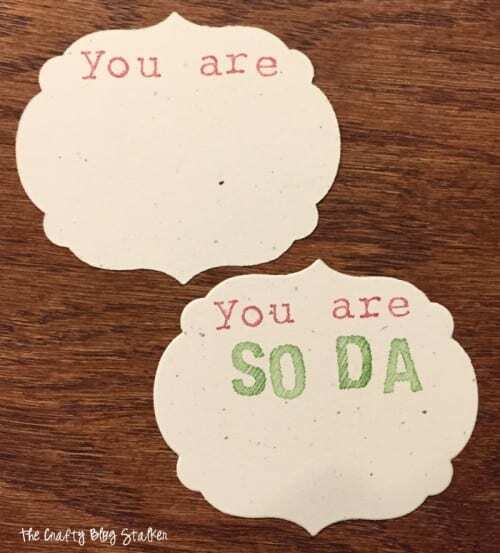 I found the original idea online on Pinterest, shared by Glued to my Crafts and you can download a printable gift tag directly from her site. 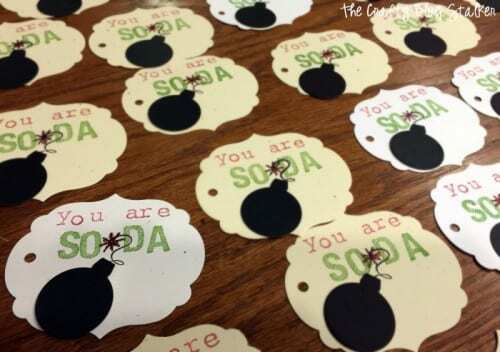 I went a little bit different route and made homemade gift tags with rubber stamps. For my tags, I used my Big Shot and cut the pieces out using Framelits. But don’t feel like you need to have these exact shapes to create your own, use what you have. Once the base pieces are cut out, it is time to add the text. I used two different font stamp sets and stamped what I wanted the tag to say. I then used a part of another stamp to get the swirly wire, and line star at the end. To make it look like it was lit, I added some red glitter glue to the spark. Then glued the black bomb shape into place. Punch a hole at the top and your tags are all finished. I gave several away, so I needed lots of tags! 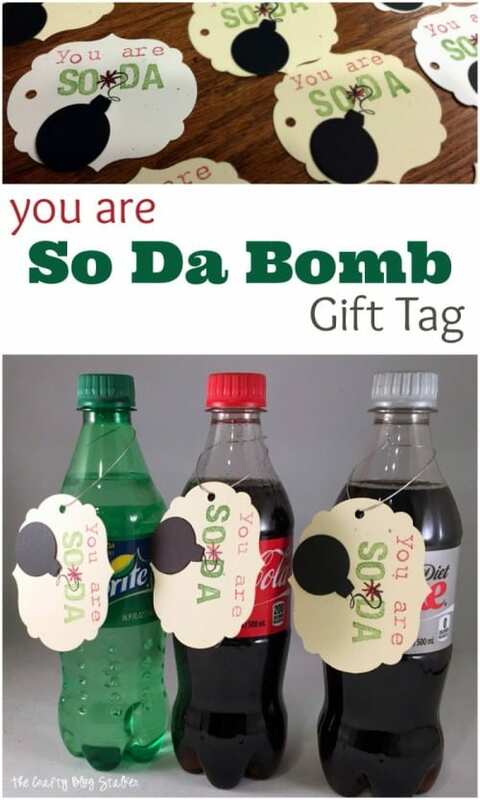 Tie a large loop of metallic cord through the hole in the gift tag and hang over the neck of the soda bottle. It was so fun to walk around work giving them to all of my favorite people. Their faces lit up as I handed them their favorite soda. What unexpected gifts have you given to friends, family, and coworkers? Share and leave a comment below! 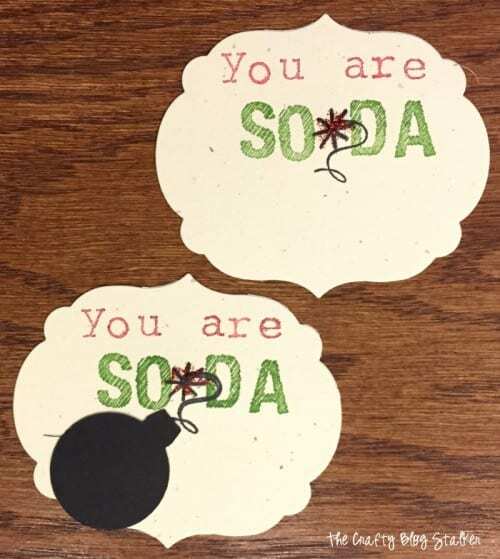 SAVE HOW TO MAKE YOU ARE SODA BOMB GIFT TAGS TO YOUR FAVORITE PAPER CRAFTING PINTEREST BOARD! Katie – This is one of the most creative gifts we have seen in a while. Super cute! We discovered you by way of the Awesome Things Tuesday link party. Well done! Katie – what a great idea! Thank you for sharing on VMG206 Brag About It. I’m pinning! This is such a cute and inexpensive gift idea. 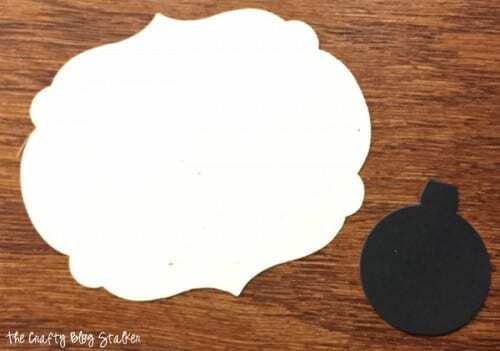 I can even use my silhouette machine to make the tags! I am going to pin this to my inexpensive gift ideas board now. Visiting from the Wow Me Wednesday Linky Party! how creative! I love this! thanks so much for sharing at #funtasticfriday ! Tweeted and pinned! 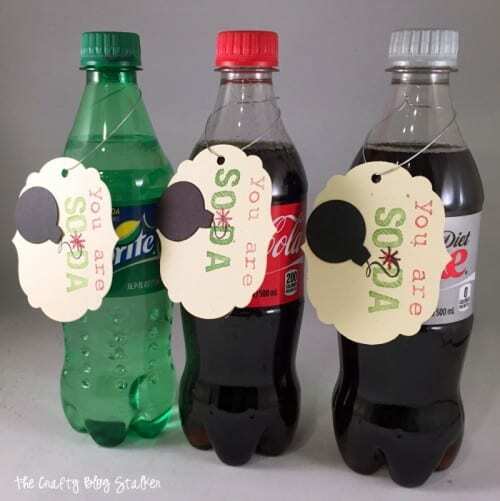 Very cute idea and thanks for sharing at Celebrate Your Story link party. I’m a sucker for a good pun and this one is awesome! Thanks again for sharing at the Celebrate Your Story Link Up Party.